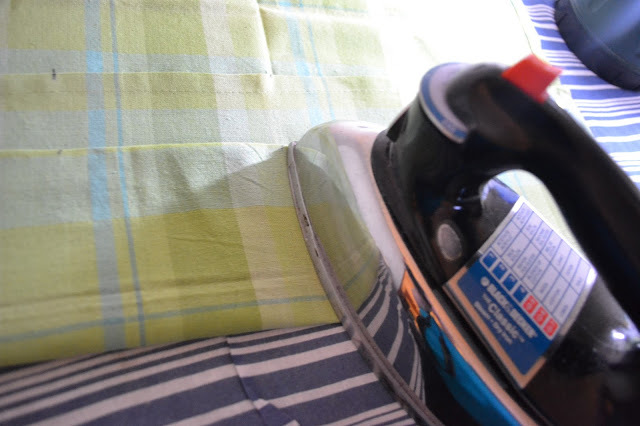 It does not require sewing skills. 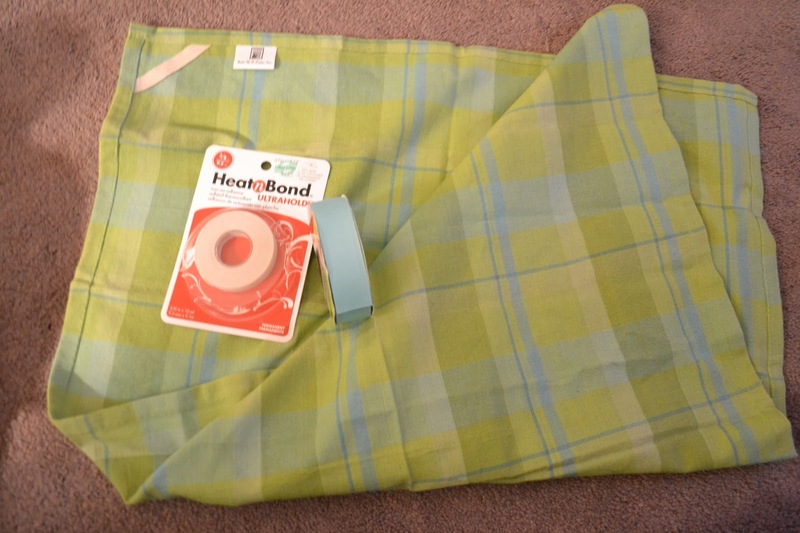 I only used a needle and thread for 2 little stitches to attach the ribbon for tying. The rest comes together with iron on fusible tape! 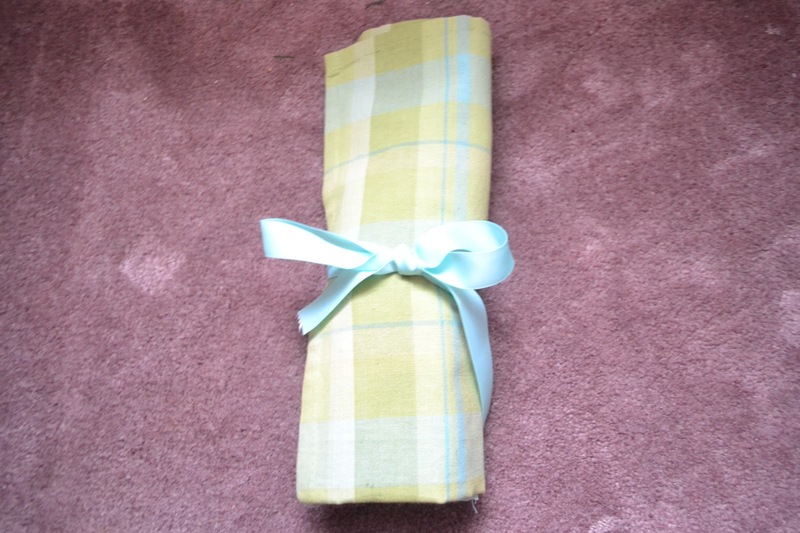 I saw this done as a sewn together craft, and they had cut a tea towel down and sewn in just one row of 4 pockets. 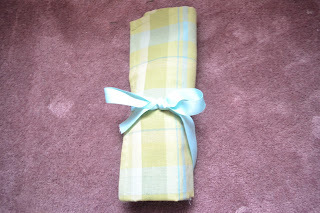 I wanted a no sew version but also a few more pockets. 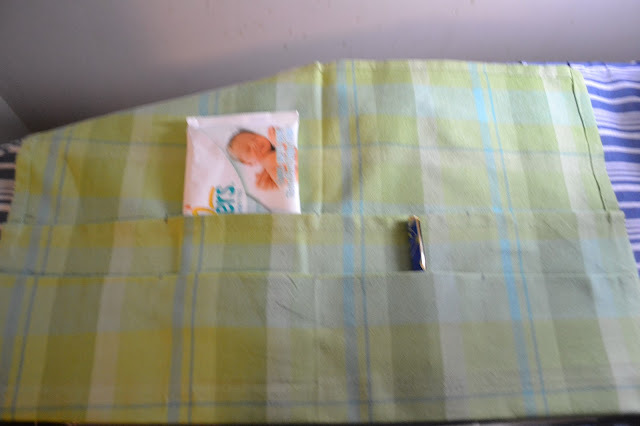 I decided to use the whole towel to make a double row of pockets. This turned out great, but makes explaining the steps a bit harder. I will do my best. 2) Bring the folded bottom edge up a few inches below the first bottom edge. 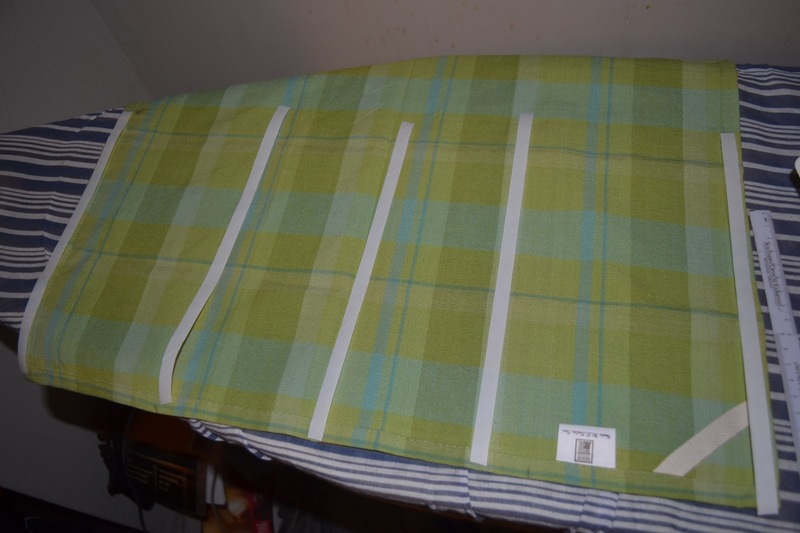 This will become the two rows of pockets. 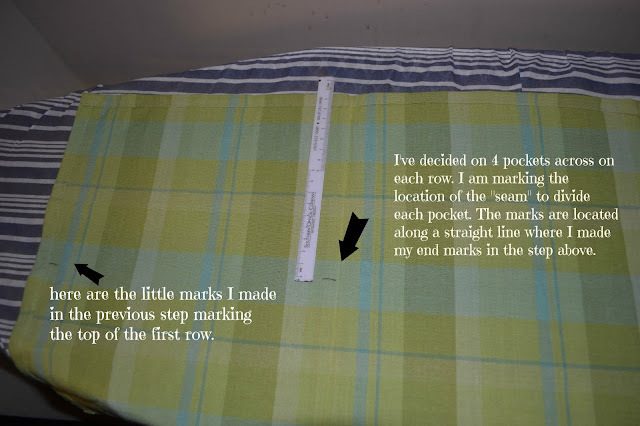 Mark with your pencil along each edge to mark the line where the top of that row will be. I have put two items in just so you can visualize the 2 rows. 3) Let's stop and take stock a moment. You should have about 3 locations for marks. as shown above. The first secret mark inside the first fold, and along the top edge of the two rows for the pockets. see above. 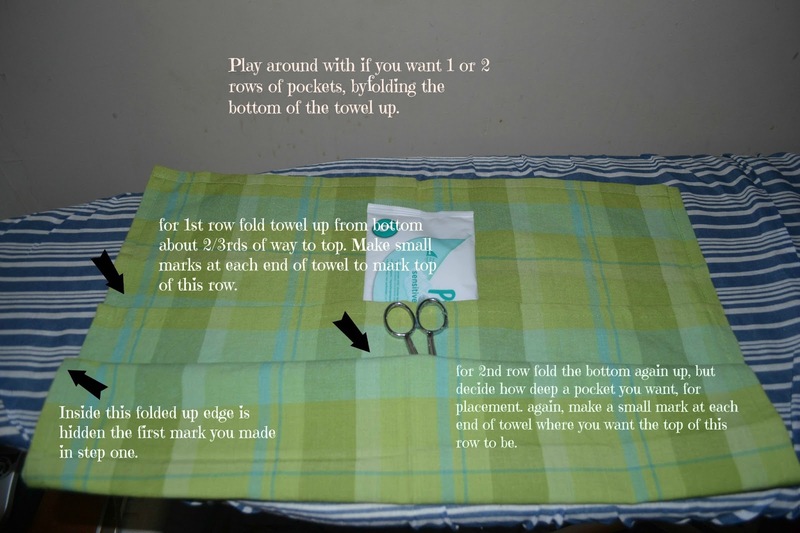 4) Now while towel is still folded as above, you can decide on how many pockets you want each row to have. 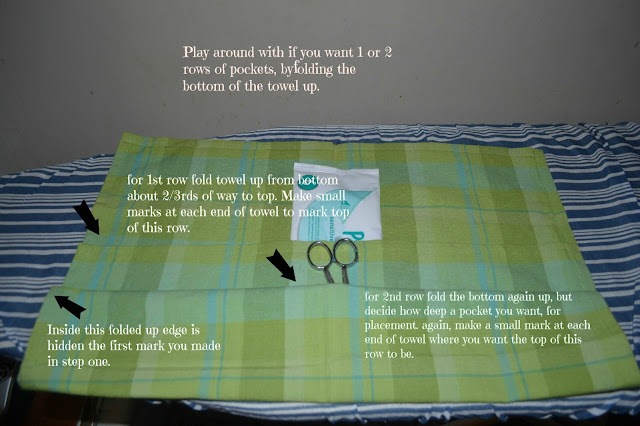 I chose 4 equal pockets for reach row, but you could do more or less pockets and each row can be different from each other. Where you want each pocket divided, make a small pencil mark underneath the underside so the mark won't show on the finished product. 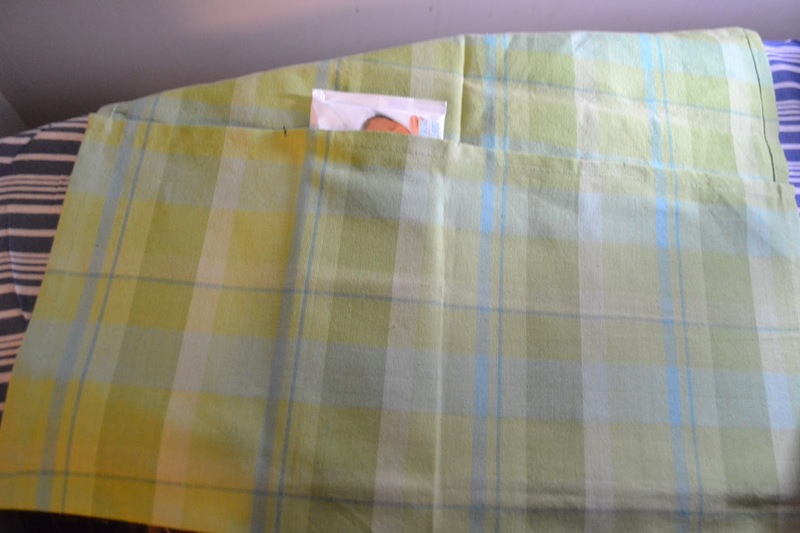 5) Open up towl and turn it right side down. This should now expose most of your hidden marks. 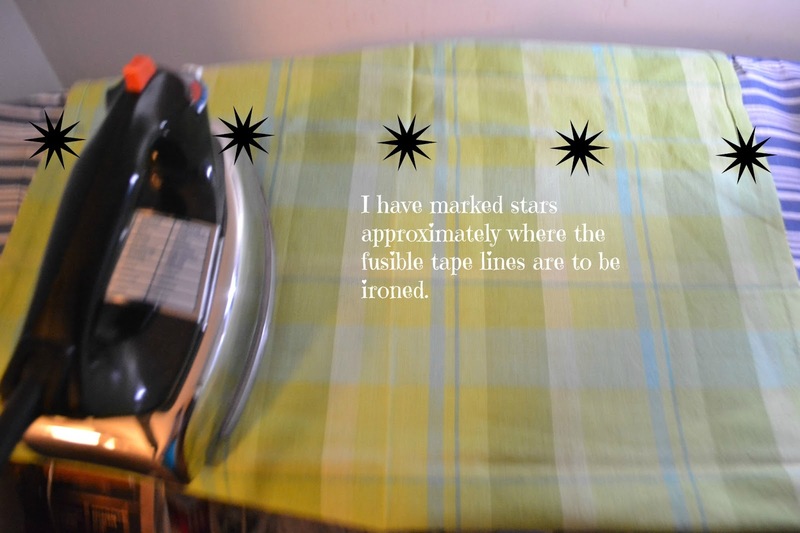 Measure the distance from the bottom of the towel to the mark for the top row. Now divide that measurement in half. So if it is 12 inches from the bottom of the towel to the top edge mark, you will want to use a 6 inch measurement. 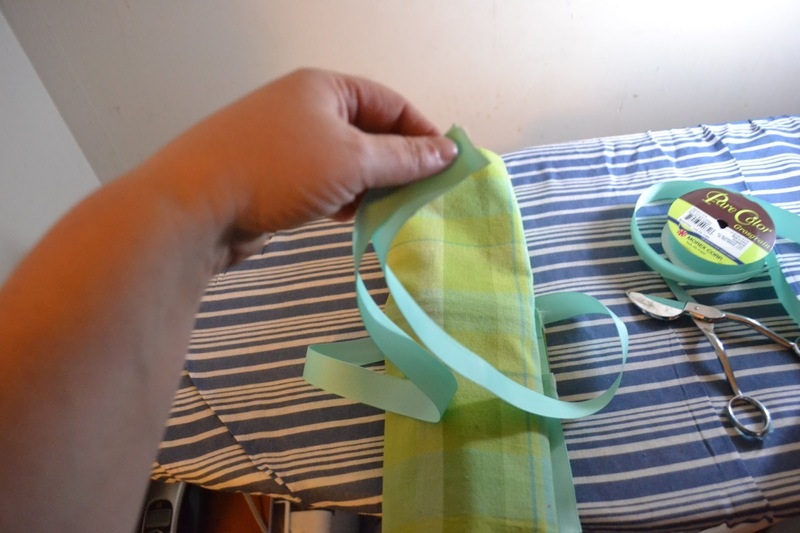 Cut enough strips (say 6 inches each) for each seam that will divide your pockets. 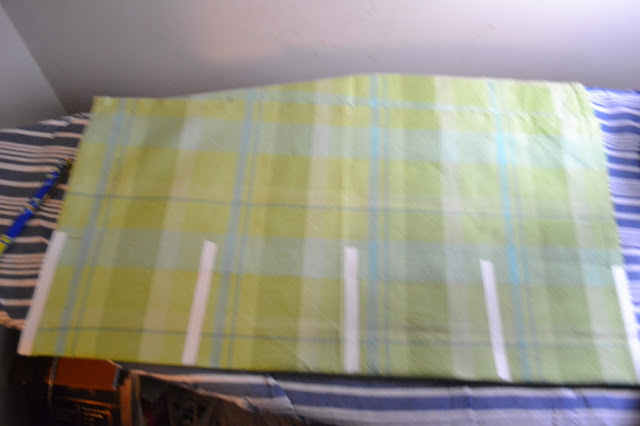 I needed 5. two to seal shut the two outer edges of the towel and then 3 more to make the reamining pockets. See below. 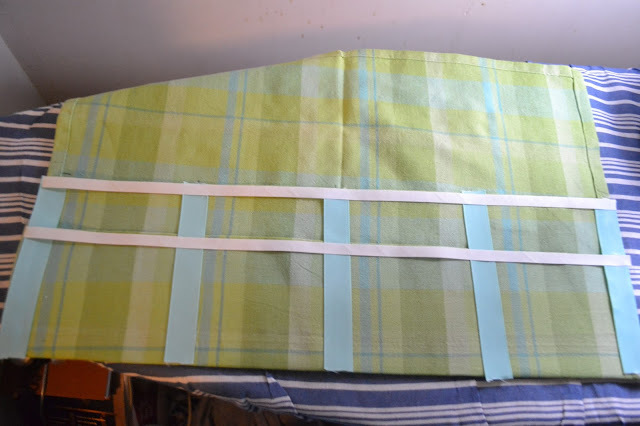 Place tape paper side up, along pocket seams. 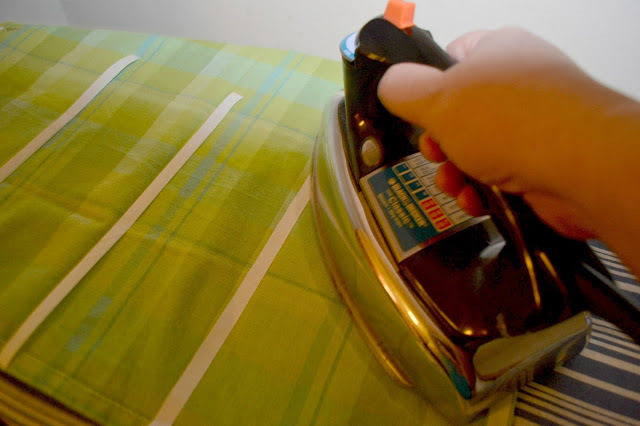 6) iron on tape using package directions to towel. 7) Peel away paper from fusible tape and you should see the shiny fusing as below. 8) Fold the bottom edge up to the original marks for the location of the first row of pockets and iron along where you know the tape is to seal the seams together. 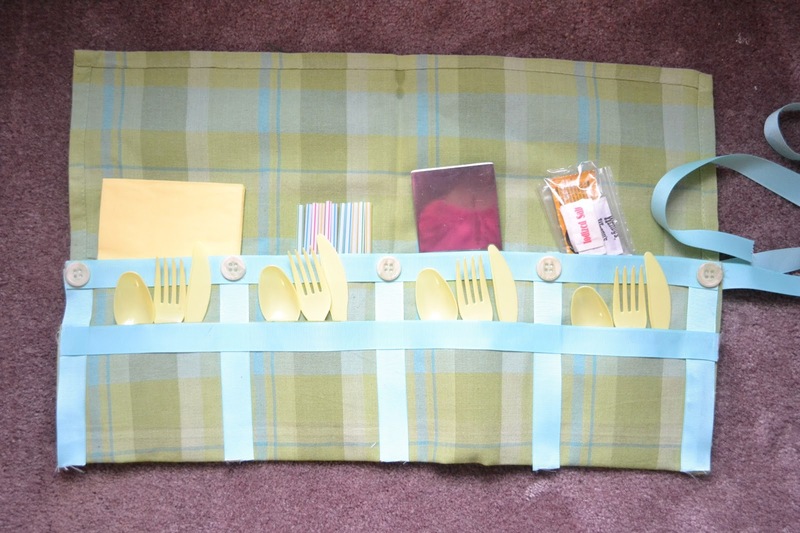 This will make your first row of pockets! See below! You now have 4 pockets! 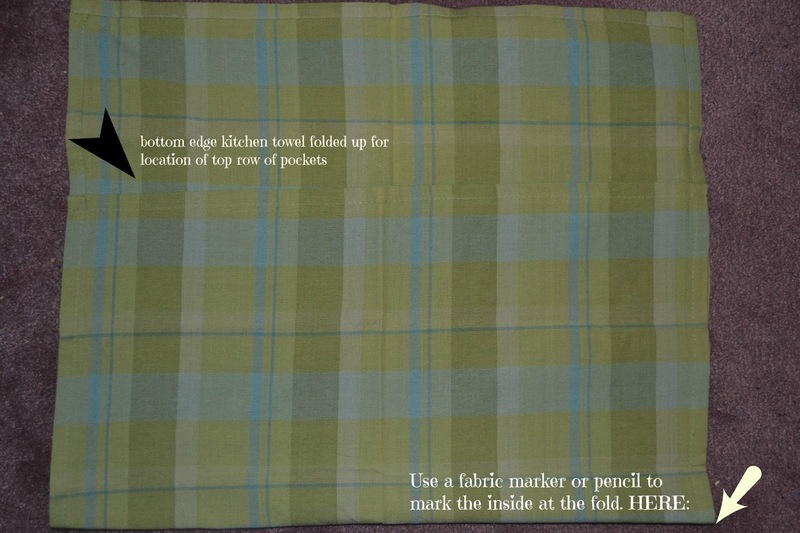 10) Remove paper from the tape and fold up to make the second row of pockets and iron the tape at each seam as before. Lets take a look: You now have 2 rows of pockets! Now lets embellish this a bit. 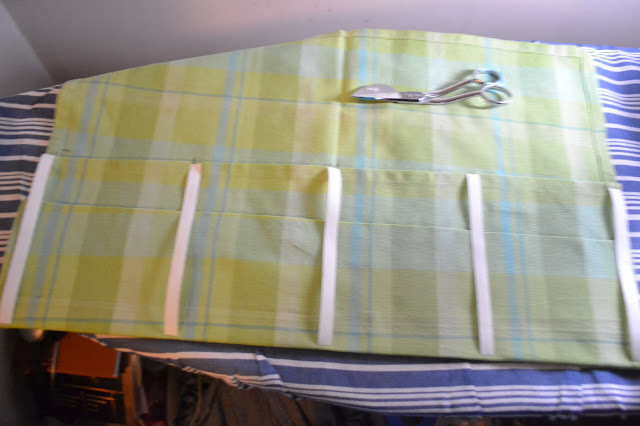 11) See picture below, and using the fusible tape, iron on fusing along each seam where the pockets are divided and iron on the strips, remove the paper tape and then place your chosen ribbon on top of fusing and iron the ribbon onto the tote. I also ironed on ribbon along the top edge of each row. 13) Almost done! Lets attach a ribbon for rolling and tying your tote. 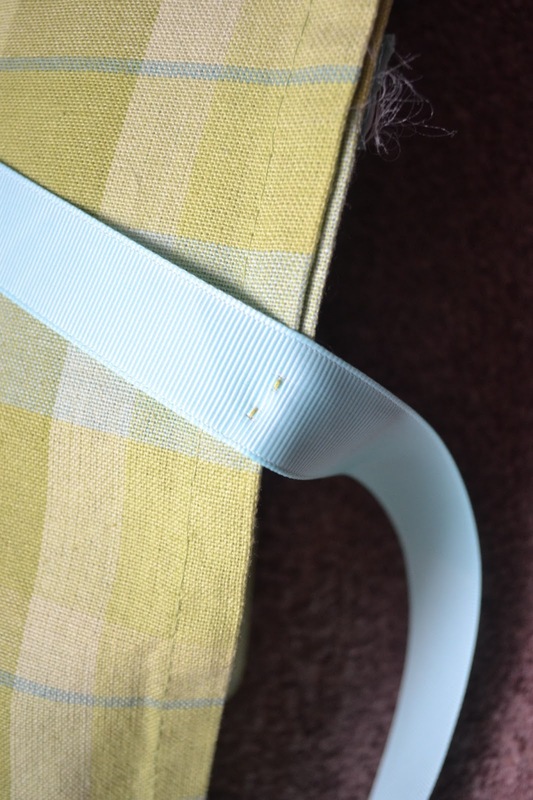 Then with your needle and thread tack your ribbon along the outside of your tote where your first row of pockets is, see the ribbon on the right side of the picture above? 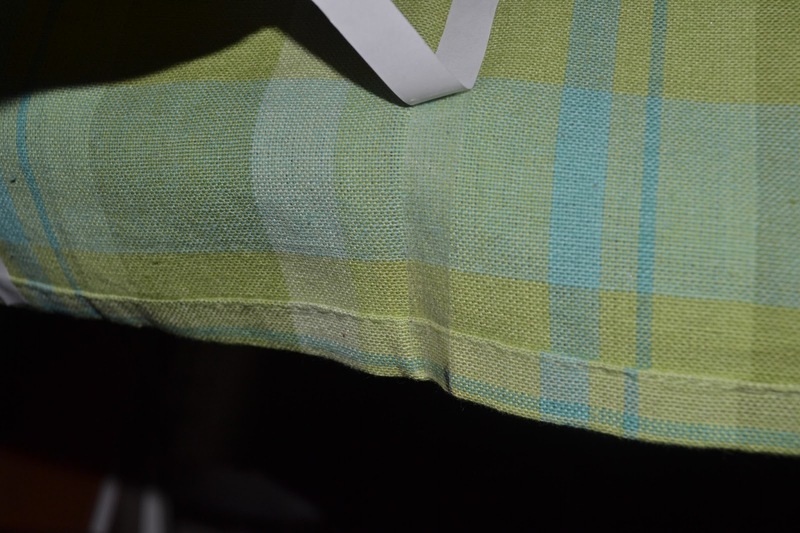 You could sew a cute button here, but I didn't do that. 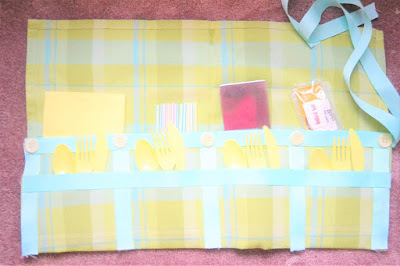 Rollup your tote and use it!